Thank you for stopping by. Without your viewership, there wouldn't be as much motivation for a blog. Hopefully I will have a finished sewing project to show you very soon! I have indeed sewn all year long but not as much for myself as for others in the fam. And, also I keep thinking I will get thinner and better looking for the modeling of the garment. A good friend emailed me and told me to stop cheating by showing the finished dress on the dress form. She wants to see me in it. So that is just what I will do. You can always tactfully say I look okay for my age! Above: My teacup is Stechol Gracie China from Homegoods/TJMax. These teacup sets usually cost about $3.99 and sometimes less if they are in the discount shelf. They are not as fragile as the antique cups but are light as a feather with a delicate feel and a very glossy finish, so nice to the touch. Although they are dishwasher safe, I notice the dishwasher eventually causes the color and the picture of the peony to fade after a lot of use so lately I have been hand-washing these teacups with a little soda-bicarbonate made into a paste. For those of you who think there is just nothing better than that mellow golden blend of Yorkshire Gold, (not Yorkshire Tea, but Yorkshire Gold) but are finding it scarce in local stores, I found something quite interesting today at the grocery store, which cost all of $4.00. Someone mentioned this to me awhile back and my ears started ringing the minute I saw it, because I remember I had nodded politely and never followed up on it. I had made up my mind nothing was as good as Yorkshire Gold. I mentally brushed off the suggestion to try Barry's Tea. The ingredients are Rwandan and Assam, the same as Yorkshire Gold. The package first attracted me because of the word "gold" which indicates lack of bitter tanic acid and not much caffeine, plus that beautiful color. Well, as you serious tea-ers know, Yorkshire Gold is a careful blend of Kenyan, Rwandan and Assam tea leaves. It seems to lack that bitter tanic acid taste found on ordinary teas and doesn't have the caffeine after-effect. Someone once told me never to drink it because I would never be content with any other black tea. That is exactly what happened. We even started stocking it ourselves at home and selling it to friends. Also, the painting of the Yorkshire Dales on the box was so pretty I always used the empty boxes for little tea-treats and sandwiches to give to people for their car trip home. A few years ago the company changed the painting and that is when I noticed a slight change in taste. I must mention Yorkshire Tea in a red box that none of my friends, who were my customers, liked, due to its hard taste, and I couldn't even give it away. Sometimes I thought there was a bit of Yorkshire Tea (the red box) in the Yorkshire Gold. Lately, though, the company seems to have changed their formula and my customers and I both notice it. Some of us had a tea tasting, with samples of tea from older shipments, and from the individually wrapped tea sachets (also different in taste), the loose leaf, and the newer shipment of plain tea bags. Everyone agreed there was a difference in taste. We stopped ordering the big shipments and started buying it again by the small box when we could find it locally. Mr. S. and I have done a taste test with two cups of tea each, using Yorkshire Gold in one and Barry's Tea in the other. We think Barry's tea is our new fave and we will be deciphering the taste over time. It is delicious! There is a difference but possibly, if Yorkshire Gold had stayed the same in taste, they would have been the same. 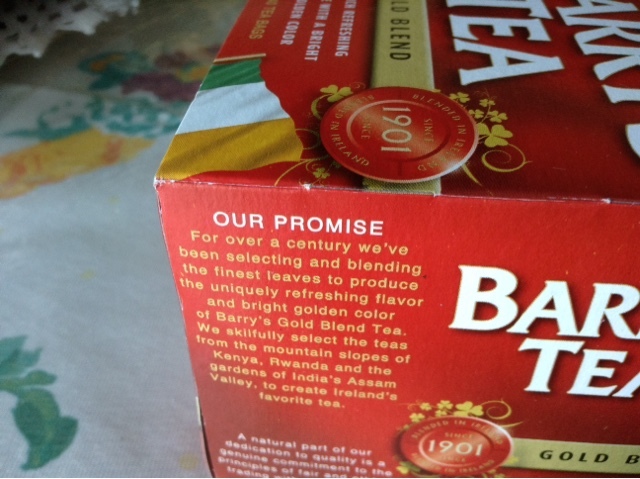 Barry's tea claims to be rich in antioxidants. It tastes as good as Yorkshire Gold. I feel "well" after drinking it, as if I had taken a dose of vitamin C.
Also, I like that the box shows it is packaged and distributed from Cork, Ireland. It feels exotic to have something in the house from Cork. 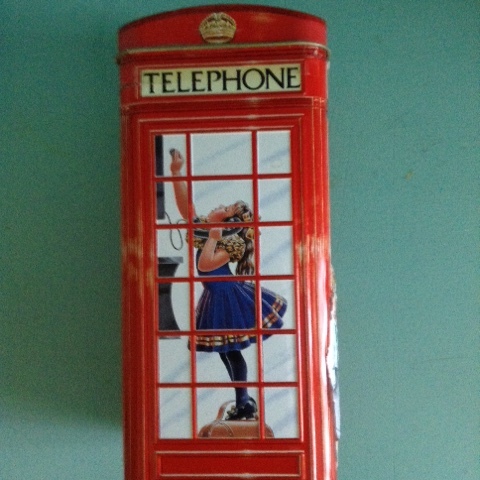 Below, you see a cookie tin my husband brought home from England 30 years ago (when he went without me) and I get a smile out of that boy waiting with a grimace for the little girl to get out of the phone booth. He might be waiting to make his own call, or he could be waiting for his sister so he could accompany her home again. Mr. S. Has a famous saying, "I will make it up to you some day," so he owes me a trip. On second thought, I might be able to make something like it at home. I was trying to avoid the sugar. Those fruit ingredients look good! I believe Celestial Seasonings has a pumpkin tea but it would require a longer trip to a more specialized grocery store. I am stopping at home and will stay stopped until my sewing is finished. This post made me smile, Lydia. I look forward to seeing you model your new dress. :) And thank you for the tea recommendation. I love tea but I don't drink it anymore because I have problems with anxiety, and caffeine makes it much worse. I hope that some day I will be able to drink it again. My husband though, still drinks several cups a day. I live in Canada and I haven't seen Barry's Tea anywhere in a store but I will keep my eyes open for it as perhaps my husband would like it. By the way, Celestial Seasonings does make a pumpkin tea - it's called Sweet Harvest Pumpkin. My daughter bought a box a little while ago, and she said it's pretty good but not great. It's a black tea with pumpkin spice flavouring added. Are you the pattern lady with a he Etsy shop? Please post your link again. Also thank you for the info about the pumpkin tea. I enjoyed reading about your tea experience. 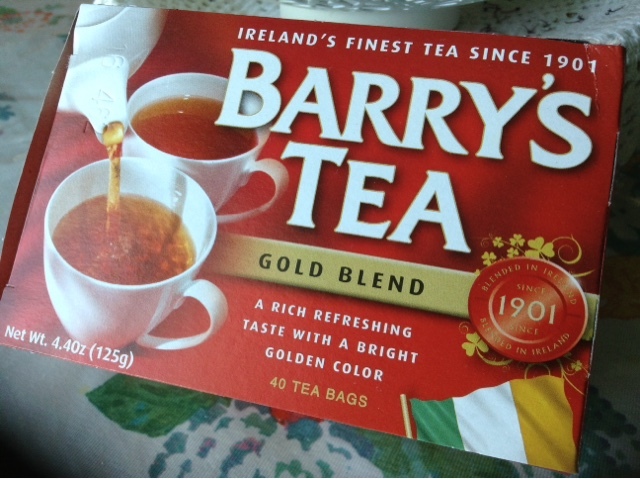 I would like to try Barry's tea now. Oh the pleasures of tea...such a wonderful daily experience. Kelly T.
Thank you for the tea suggestion. 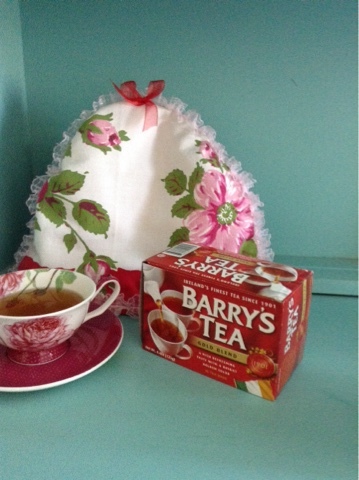 Could you share with us the name of the store where you found Barry's Tea? Tea starts my day and I have always had it in a cup and saucer. Mugs hold too much tea! I wish I could drink it throughout the day as I did when younger. Have to limit my caffeine as I have gotten older. Please do not worry about looking older or size when modeling your dresses. They are all beautiful and so are you! Our Safeway grocery store had Barry's tea but I am not sure that would so in all Safeways. I know they have Safeway in Australia. Sometimes we can feel out a suggestion card and get things in our local store.mits possible someone here did that. But give it a try. Also ask for suggestion/comment cards from your local grocery store, no matter what the name of the store. They will sometimes stock the item. Sherry, I'm glad to see you and it's a thrill to me you drive by the company I am talking about here. The green tea of that brand hasn't appeared on the shelf yet. I'm all for imports as long as we can export something of equal goodness. We have wool and blackberries and lumber, and some pretty good flour. Hope you see at least one of our exports on your shelves. Laura Jeane, we could make pumpkin tea at home...I just need to think of a formula. 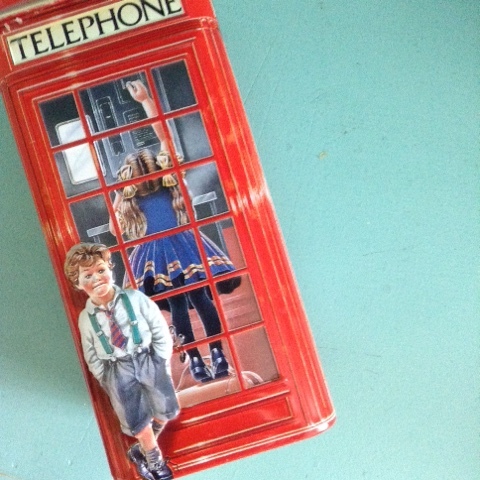 HI Lydia~ I was so delighted to read Cork, Ireland in your topic and post today. 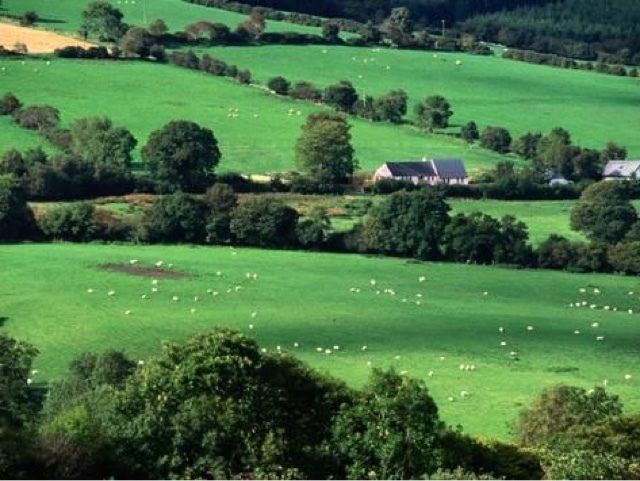 My husband's family, on his Mom's side, is from County Cork. We have never been, but dream of it someday. I too would be interested in a homemade pumpkin spice tea recipe. I don't do well with caffeinated teas, and have found simple is the best. Your tip for blueberry tea has been my favorite. I take blueberries and pour hot water over them, than add a tiny swirl of cinnamon honey. It's very delicious. And fun to make. Barry's Gold was my favorite tea for a number of years until earlier this year when I gave up caffeine as it was not treating me well. I gave up my morning cup of coffee and now drink hazelnut Teecino instead and just stopped all caffeinated tea at the same time because of two incidences of heart palpitations. I never tested if just tea had the same effect on me as I was so scared when that happened but it is tempting. I love the color of Barry's and with a little milk and sugar it is just heavenly to me. I know they make a decaf version of regular Barry's, which I've heard is no where near as good. Enjoy your new tea! I had been planning to send you a box of this for a surprise once I found out how truly good it was, and just hadn't gotten to it yet! I found it while looking through an extensive imported food section at a special grocery, so it didn't occur to me that you might find it up there as well! So much color and scent, and no bitterness. I'm so glad you found it, I think of you every time I get a cup! I used to love one called PG Tips, also a special English tea, but it seemed to get bitter after I had bought it for a while too. I wondered if it was "just me", but it sounds like your story about Yorkshire. 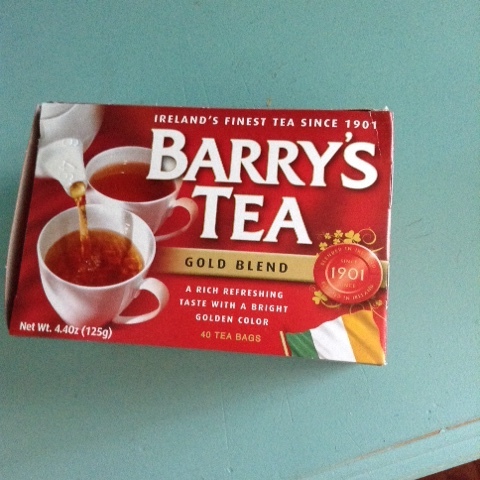 But after trying the Barry's, I know how tea can and should taste! Also, I have always thought, while looking at you modeling a dress, "She does such a wonderful job of staying slim, and looks so sweet"! Where can I get Barry's tea? I live in Pennsylvania...south central area. That first picture looks so much like where we are living that at first I thought it was one of the pictures I'd sent you! 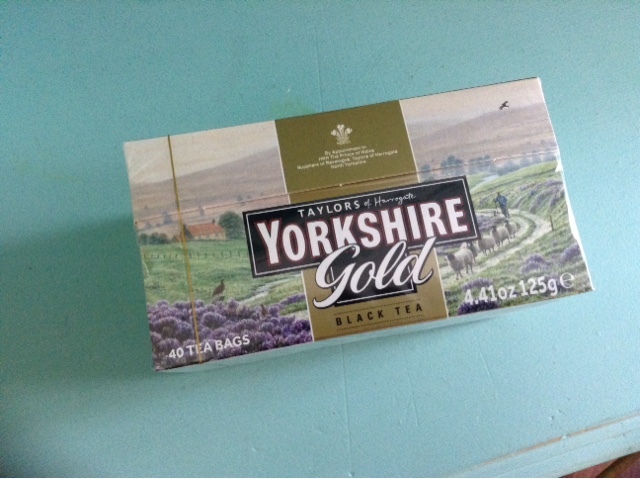 We have a box of Yorkshire tea here--I will have to check if it is "gold" or not. It's funny how everyone expects tea here when they come to visit--something I never experienced in America. It's nice though. As a tea lover, you will need to look at the offerings from Harney & Sons. They are online, just look them up. Fantastic teas! !